This blog is devoted to discussion of science, especially climate science. But in the run up to US Presidential election, along with the drive to enforce the Paris Accord (not a treaty), most of what is appearing in the media has zero scientific content. The discourse now consists almost entirely of climate folklore. From the above, it is clear that folklore expresses a community’s understanding of the way things are, and how things work. Each society passes along its wisdom, most pointedly in proverbs or fables. It thus includes scientific principles of the day as they pertain to an average person’s life experience. The intersection of folk and scientific wisdom is demonstrated in a case regarding an Arizona Navajo reservation. 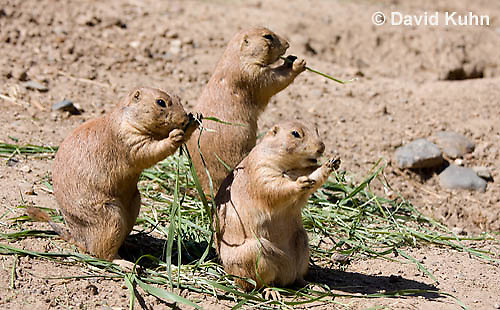 Government officials in the 1950’s proposed to get rid of prairie dogs on some parts of the reservation in order to protect the roots of the sparse desert grass and thereby maintain at least marginal grazing for sheep. Navajos objected strongly, insisting, “If you kill off all the prairie dogs, there will be no one to cry for the rain.” Of course they were assured by the amused government men that there was no conceivable connection between rain and prairie dogs, a fact that could be proven easily by a simple scientific experiment: a specific area would be set aside and all the burrowing animals there would be exterminated. The experiment was carried out, over the continued objections of the Navajos, and its outcome was surprising only to the white scientists. Today, the area […] has become a virtual wasteland with very little grass. Apparently, without the ground-turning processes of the little burrowing animals, the sand in the area becomes solidly packed, causing a fierce runoff whenever it rains. But folk wisdom is an unreliable, inconsistent kind of wisdom. For one thing, most proverbs coexist with their exact opposites, or at least with proverbs that give somewhat different advice. Now that climate change has passed into social discourse, proverbs and unsubstantiated claims are voiced among like-minded people, thereby reinforcing shared beliefs without any critical analysis to verify an objective reality to the sayings. 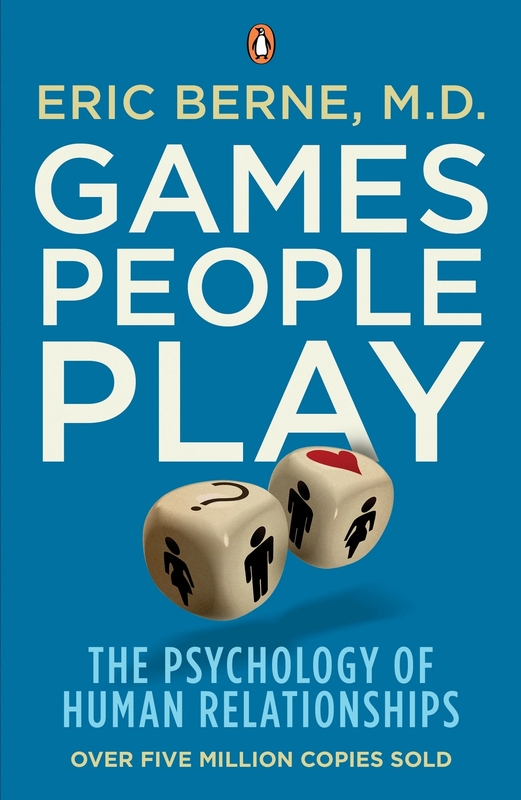 Dr. Eric Berne was the author of Games People Play, the 1960s groundbreaking book in which he introduced Games and Transactional Analysis to the world. According to Dr. Berne, games are ritualistic transactions or behavior patterns between individuals that can indicate hidden feelings or emotions. A runaway success, Games People Play spent more than two years on the New York Times bestseller list in the mid 1960s – longer than any non-fiction book over the preceding decade. See What You Made Me Do. He also describes other types of games (underworld, sexual, marital games, etc.). But for this post it is obvious that most of the discourse on Climate Change fits into a party game called Ain’t It Awful. Lubos Motl reviewed the movie (here) and rates it “the most superficial movie on the climate issue so far.” A perfect contribution to climate folklore. Modern folklore must sound “sciencey” to be taken seriously. In this folklore you hear the refrain, “scientists tell us . . . “, much as in a previous age “thus spake the prophet . . .” As the Navajo example shows, sciencey beliefs have no guarantee of validity. As Dr. Berne observes: In the pastimes there is no denouement or payoff, but much unworthy feeling. Of course, if climatists go beyond talking and succeed enacting ruinous energy policies, we will all suffer from economic declines, lower standards of living, along with associated social frictions. Bad feelings will be widespread, albeit from real self-inflicted calamities rather than imaginary ones. Paul Driessen tells it like it is in this Town Hall article (here). Some excerpts that struck me and some bolding that I added. No Real-World evidence supports a “dangerous manmade climate change” thesis. In fact, a moderately warmer planet with more atmospheric carbon dioxide would hugely benefit crop, forest and other plant growth, wildlife and humans – with no or minimal climate effect. A colder planet with less CO2 would punish them. And a chillier CO2-deprived planet with less reliable, less affordable energy (from massive wind, solar and biofuel projects) would threaten habitats, species, nutrition and the poorest among us. And yet, as Hurricane Matthew neared Florida on the very day the Paris climate accord secured enough signatures to bring it into force, politicians, activists and reporters refused to let that crisis go to waste. Matthew was a powerful storm that left destruction and death in its wake, especially in impoverished Haiti. Its slow track up the southeastern US coastline pummeled the region with rain, flooding and more deaths. But it was a Category 1 hurricane with 75 mph winds when it made landfall in South Carolina October 8, and a post-tropical storm as it moved offshore from North Carolina a day later. It is clearly not climate change that threatens the poor. It is policies imposed in the name of preventing climate change that imperil poor, minority, blue-collar, farm and factory families. The impacts of climate change obsession on developing nations would be far worse, if they bowed to President Obama’s suggestions and agendas. African nations, he has said, should “leapfrog” “dirty” fossil fuels and instead utilize their “bountiful” wind, solar, geothermal and biofuel resources. In practice, that would mean having expensive, intermittent electricity and growing biofuel crops on Africa’s nutrient-depleted, drought-stricken lands, with no fertilizer, mechanized farming equipment or GMO seeds. Thankfully, few developing countries are listening to such nonsense. Instead, they are using oil, natural gas and especially coal, in ever-increasing amounts, to lift their people out of abject poverty – because the “climate-saving” Paris non-treaty imposes no restrictions on their use of fossil fuels. 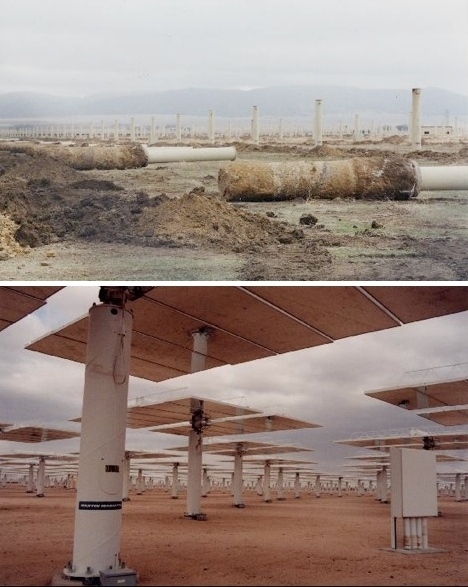 Keeping fossil fuels in the ground really means depriving people of reliable, affordable electricity; prolonging unemployment and poverty; having no feed stocks for plastics and petrochemicals, except what might come from biofuels; and blanketing hundreds of millions of acres of farm, scenic and habitat areas with biofuel crops, 400-foot-tall wind turbines, vast solar arrays and new transmission lines. When taxpayers, consumers, unemployed workers and poor families finally recognize these inconvenient truths, the world will be a far better place – with true freedom, justice and opportunity for all. Looking at the leaked news from the NAFTA tribunal, the damages of $25M plus $3M legal costs are much less than the $568M claimed by Windstream (US company) following a 2011 cancellation of a Lake Ontario wind farm. As has been discussed in a previous post Electrical Madness in Green Ontario, the long-term costs from these ill-advised renewable energy projects far exceed the costs of this judgment, if it stands as reported. Green economics was on full display this week when the Ontario provincial government decided to cancel contracts for additional electrical power from renewables, such as those previously offered in March 2016.
the act or process of using one’s assets and resources to increase one’s share of existing wealth without creating new wealth. (specifically) the act or process of exploiting the political process or manipulating the economic environment to increase one’s revenue or profits. a person who pays a regular charge for the use of a public utility, as gas or electricity, usually based on the quantity consumed. The background of this predicament is here Electrical Madness in Green Ontario. Mr. Thibeault said contracts signed in an earlier green-energy procurement will be honoured. In March, the province reached 16 deals with 11 firms to build wind, solar and hydroelectric projects for a total of 455 megawatts of new capacity. The negotiated prices were much lower than earlier fixed-price contracts for renewables because of the competitive bidding. Ontario already has more than 4,000 MW of wind capacity and 2,000 of solar power. The Liberal government has been under pressure from the opposition and rural residents who oppose wind farms to scale back its renewable plans and to find a way to trim increases in electricity prices. But the cancellation was a shock to the renewable-energy industry, which was counting on the new program, which would have awarded contracts for about 1,000 MW of projects in 2018. John Gorman, president of the Canadian Solar Industries Association, said the decision could hurt manufacturers and installers of solar product in the province just as they are becoming significant global competitors. Several rent-seekers as well as the Energy Minister said renewable prices were coming down, but didn’t say they are still several multiples of the $23/MWh Ontario wholesale price. Nor did anyone point out the cancellation is only avoiding a future rate increase, not bringing rates down. 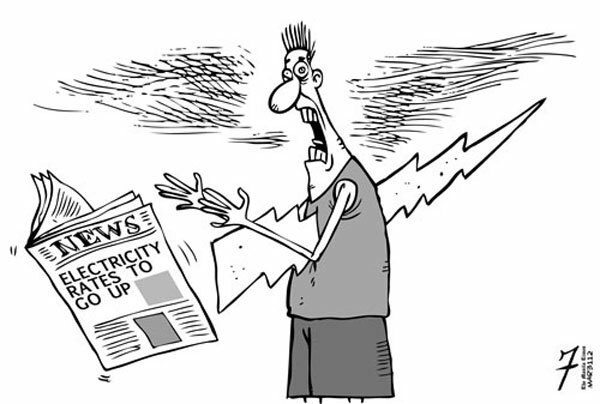 The politics have forced the administration into promising an 8% cut in consumer electricity rates, and it can only come from reducing the subsidies. Hence the howling. The recent G20 summit took on the appearance of the Mad Hatter’s tea party (Alice in Wonderland) when the G7 produced a statement saying they are committed to ending “fossil fuel subsidies.” Terence Corcoran of Financial Post (here) on the fossil fuels subsidies folly. 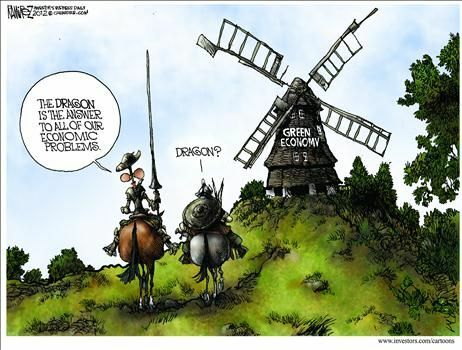 In 2010 the wind energy sector received 42% of total federal subsidies while producing only 2% of the nation’s total electricity. 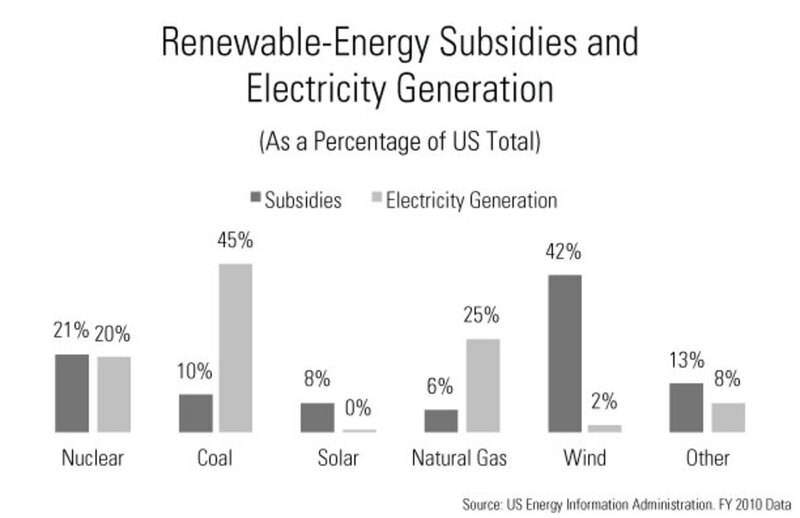 By comparison, coal receives 10% of all subsidies and generates 45% and nuclear is about even at about 20%. Climate activists and renewables lobbyists are acting like Mad Hatters, twisting language and logic to pursue their agendas. Let there be some common sense injected here. In contrast, a tax reduction is NOT a subsidy. A tax credit says an industry gets to keep more of its own money that it has produced selling a product people want and need in the free market. There is a huge difference between a law that lets you keep more of your own money; and another law that actually gives you someone else’s money. The two are not the same thing. Actually, the oil industry pays higher taxation rates than other industries and subsidizes the government with the billions it pays in taxes, not the other way around. There are also billions more in economic benefit to the nation from the jobs they create and the increased mobility and productivity people enjoy by using our transportation system based on hydrocarbon fuels. The Mad Hatters turn things upside down. Society is subsidized and made wealthy by fossil fuels, not the other way around. Some of that wealth is being diverted to renewable energy companies who do not create enough value to be in business without direct payments of tax dollars. They prove it by declaring bankruptcy when their subsidies are reduced. Worse, hooking up wind and solar intermittent power to electrical grids adds more cost and unreliability than the renewable power is worth. At its prime, the Carrizo Plain (S. California) was by far the largest photovoltaic array in the world, with 100,000 1′x 4′ photovoltaic arrays generating 5.2 megawatts at its peak. The plant was originally constructed by ARCO in 1983 and was dismantled in the late 1990s. The used panels are still being resold throughout the world. Over the past 30 years, human-caused climate change has nearly doubled the amount of forest area lost to wildfires in the western United States, a new study has found. The result puts hard numbers to a growing hazard that experts say both Canada and the U.S. must prepare for as western forests across North America grow warmer and drier and increasingly spawn wildfires that cannot be contained. Abstract: Increased forest fire activity across the western United States in recent decades has contributed to widespread forest mortality, carbon emissions, periods of degraded air quality, and substantial fire suppression expenditures. Although numerous factors aided the recent rise in fire activity, observed warming and drying have significantly increased fire-season fuel aridity, fostering a more favorable fire environment across forested systems. We demonstrate that human-caused climate change caused over half of the documented increases in fuel aridity since the 1970s and doubled the cumulative forest fire area since 1984. This analysis suggests that anthropogenic climate change will continue to chronically enhance the potential for western US forest fire activity while fuels are not limiting. That means that other factors, like natural variability, have compounded with climate change to result in longer fire seasons, larger individual fires, and a ninefold increase in the area burnt over the past 30 years. Another factor could be the amount of dry, unburned wood that has built up over decades of efforts to suppress wildfires, suggests Abatzoglou. So one solution going forward could be to allow controlled fires to burn off that tinder when conditions are wetter. “We do see a really strong coupling between climate change and forest fire in the Western United States,” he says, but “I think there may be ways to weaken that relationship” – by minimizing fuel for these massive wildfires. Before major wildfire suppression programs, boreal forests historically burned on an average cycle ranging from 50 to 200 years as a result of lightning and human-caused wildfires. Wildfire suppression has significantly reduced the area burned in Alberta’s boreal forests. However, due to reduced wildfire activity, forests of Alberta are aging, which ultimately changes ecosystems and is beginning to increase the risk of large and potentially costly catastrophic wildfires. Essentially the report acknowledged that the trees surrounding Fort McMurray are hard-wired for fire and if they are not managed properly then these types of catastrophic fires will become more common. The warm weather may have accelerated the fires season, but the stage was set for such a fire and not enough work was done to avoid it. No matter how a fire ignites, a forest fire becomes dangerous because of the weather conditions allowing it to start and to grow. The potential for forest fires is often indicated by the Haines Index (HI) that has been widely used for operational fire-weather forecasts in regions of the United States, Canada, and Australia. 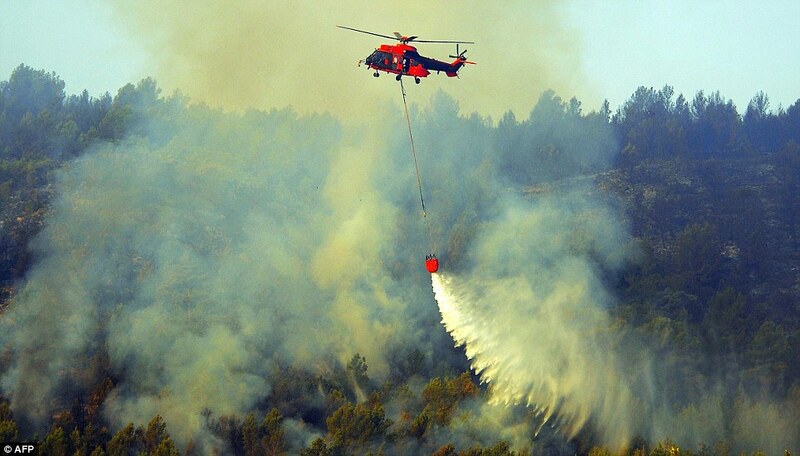 Several studies have shown a positive correlation between HI and observed fire activity. An important study (here) demonstrates HI is strongly linked to ocean oscillation events such as El Nino. The Haines index (HI) is a fire-weather index that is widely used as an indicator of the potential for dry, lowstatic-stability air in the lower atmosphere to contribute to erratic fire behavior or large fire growth. This study examines the interannual variability of HI over North America and its relationship to indicators of large-scale circulation anomalies. The results show that the first three HI empirical orthogonal function modes are related respectively to El Nino–Southern Oscillation (ENSO), the Arctic Oscillation (AO), and the interdecadal sea ~ surface temperature variation over the tropical Pacific Ocean. During the negative ENSO phase, an anomalous ridge (trough) is evident over the western (eastern) United States, with warm/dry weather and more days with high HI values in the western and southeastern United States. During the negative phase of the AO, an anomalous trough is found over the western United States, with wet/cool weather and fewer days with high HI, while an anomalous ridge occurs over the southern United States–northern Mexico, with an increase in the number of days with high HI. After the early 1990s, the subtropical high over the eastern Pacific Ocean and the Bermuda high were strengthened by a wave train that was excited over the tropical western Pacific Ocean and resulted in warm/dry conditions over the southwestern United States and western Mexico and wet weather in the southeastern United States. The above conditions are reversed during the positive phase of ENSO and AO and before the early 1990s. There is strong evidence from the United States and globally that forest growth has been increasing over recent decades to the past 100+ years. Future prospects for forests are not clear because different models produce divergent forecasts. However, forest growth models that incorporate more realistic physiological responses to rising CO2 are more likely to show future enhanced growth. Overall, our review suggests that United States forest health has improved over recent decades and is not likely to be impaired in at least the next few decades. Although models suggest that global timber productivity will likely increase with climate change, regional production will exhibit large variability, as illustrated in Table 1. In boreal regions natural forests would migrate to the higher latitudes. Countries affected would likely include Russia and Canada. Warming could be accompanied by increased forest management in northern parts of some of these countries, particularly the Nordic countries, as increased tree growth rates are experienced. Climate change will also substantially impact other services, such as seed availability, nuts, berries, hunting, resins, and plants used in pharmaceutical and botanical medicine and the cosmetics industry, and these impacts will also be highly diverse and regionalized. Again we see jumping to a conclusion to get a simple (simplistic) reduction of a complex reality. 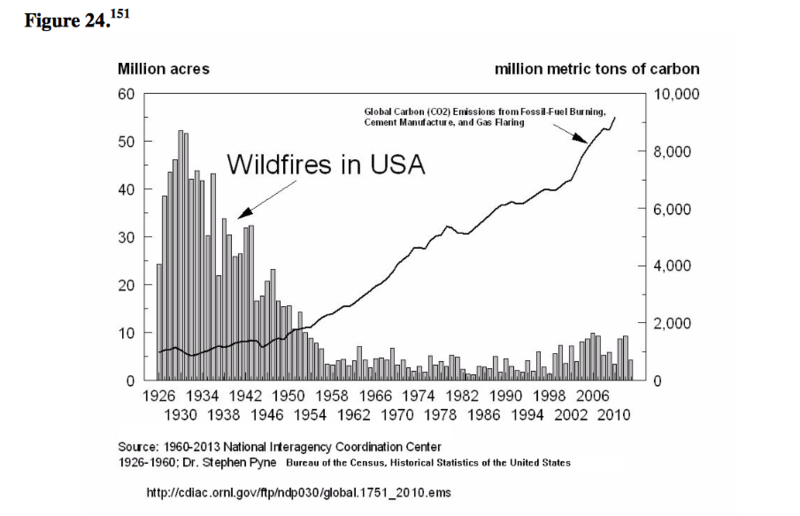 In legal terms, blaming forest fires on CO2 is a rush to judgment. Yes, forests are affected by more CO2 and milder temperatures. They grow stronger and more resilient to all kinds of threats, including forest fires. The incidence of forest fires is associated strongly with drier conditions resulting from ocean oscillations and accompanying atmospheric circulations. Humans play a role in land usage, timber management and fire suppression policies. The scale of the decarbonisation challenge to meet the Paris Agreement is underplayed in the public arena. It will require precipitous emission reductions and a new carbon sink on the scale of the ocean sink within 40 years. Even then, the world is extremely likely to overshoot. A catastrophic failure of policy, for example waiting another decade for transformative policy and full commitments to fossil-free economies, will have irreversible and deleterious repercussions for humanity’s remaining time on Earth. Only a global zero carbon roadmap will put the world on a course to phase-out greenhouse gas emissions and create the essential carbon sinks for Earth-system stability, without which, world prosperity is not possible. Background for this and other such climate alarms is an activist assumption not often openly proclaimed because it is so clearly a leap of faith, not science. Emissions scenarios leading to CO2-equivalent concentrations in 2100 of about 450 ppm or lower are likely to maintain warming below 2°C over the 21st century relative to pre-industrial levels. These scenarios are characterized by 40 to 70% global anthropogenic GHG emissions reductions by 2050 compared to 2010, and emissions levels near zero or below in 2100. Thus is born the “450 Scenario” by which governments can be focused upon reducing emissions without any reference to temperature measurements, which are stubbornly failing to rise alarmingly. Within the international expert community, “2 degrees” is generally used as shorthand for a low carbon scenario under which CO2 concentrations in the earth’s atmosphere are stabilized at a level of 450 parts per million (ppm) or lower, representing approximately an 80% reduction in greenhouse gas emissions from current levels, which according to certain computer simulations would be likely to limit warming to 2 degrees Celsius above pre-industrial levels and is considered by some to reduce the likelihood of significant adverse impacts based on analyses of historical climate variability. Calvin Beisner at CFACT (here) provides a full rebuttal of the alarmist logic embodied in the above “Gamble” paper. First, predictions of rapid warming from enhanced atmospheric greenhouse gas concentration are based on computer climate models that “run hot,” two to three times the warming actually observed over relevant periods, and therefore provide no rational basis for predicting future GAT. Second, nobody—but nobody—has demonstrated scientifically that global average temperature (GAT) is optimal up to 2°C above the pre-industrial average (the limit aimed for by the Paris agreement) , or that GAT higher than that will even be net harmful, let alone catastrophic. Third, the aim of “Earth-system stability” is scientifically absurd—undefined, unnatural, and unachievable. Natural systems—especially coupled non-linear chaotic fluid-dynamic systems like Earth’s climate—are not, never have been, and never will be stable. Fourth, it is sheer fear-mongering without a shred of scientific evidence to say that “waiting another decade for transformative policy and full commitments to fossil-free economies” would be a “catastrophic failure of policy” with “irreversible and deleterious repercussions for humanity’s remaining time on Earth”. Fifth, even if real scientific investigation (which doesn’t stop with modeling but tests models by empirical observation) could tell us what future temperatures will be and the positive and negative impacts, that wouldn’t tell us how we ought to respond, i.e. what policies to pursue. While science can inform policymakers, it can’t determine policy. Even assuming the IPCC’s exaggerated estimates of CO2’s warming effect and assuming full implementation of all nations’ commitments under the Paris agreement, at a cost of $1 to $2 trillion annually from 2030 onward, Björn Lomborg calculates it would reduce GAT in 2100 by just 0.17° C, an amount too little to be noticed or have significant impact. The shortage stems from repairs to the Trans-Northern Pipeline, ordered by the National Energy Board (NEB), which called for a further 10 per cent restriction to the pipeline’s total pressure. And that’s causing the pressure to build for drivers counting on gassing up at the pump for weekend travel. Pipelines remain the safest, most efficient and environmentally friendly way to transport fossil fuels. The regulatory body is doing their job and forcing a temporary restriction on the flow of gasoline to ensure long-term safety of pipeline operations. The scramble over 10% petrol shortages in metropolitan Toronto is just a hint of what can be expected if Greens have their way and ”Leave It in the Ground.” Be careful what they wish for, unless you also want to stop mobility for everyone and everything. The NEB has issued an Amending Safety Order to TNPI that consolidates three previous Safety Orders issued between 2009 and 2010. 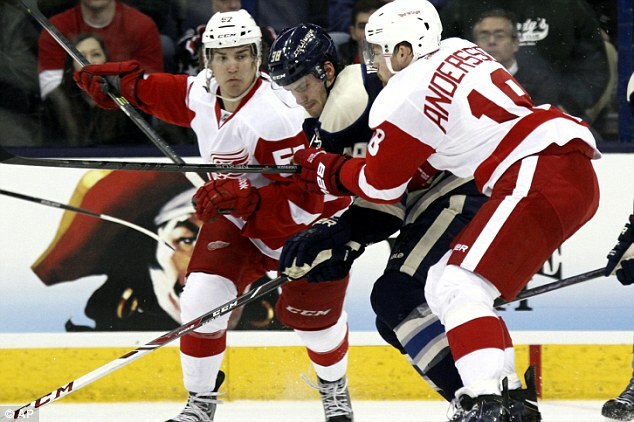 None of the overpressure incidents posed an imminent public safety or environmental risk. Operating a pipeline within its approved pressure range is an NEB regulatory requirement. The NEB takes safety and environmental protection seriously and took action to ensure TNPI completes all requirements. “Trans-Northern will continue to be vigilant in its monitoring and maintenance activities, including operating below approved pressure ranges until we are confident the pipeline can return to full capacity,” said Jackie Medeiros of Hill and Knowlton Strategies. 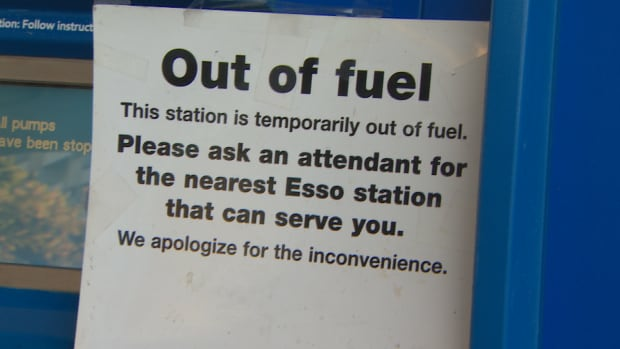 “A lot of gas stations going forward are going to have to scramble to get their gasoline…It won’t be everyone at the same time but this could go on for several weeks.” In the meantime, fuel expert Dan McTeague of GasBuddy.com predicts rolling shortages from Ottawa to Sudbury to Hamilton. 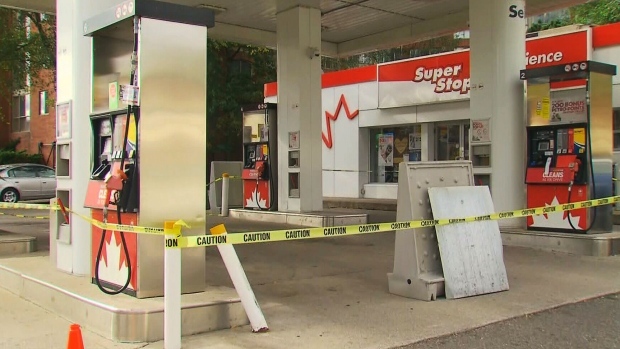 A number of Toronto gas stations are cordoned off with yellow tape as a gasoline shortage has forced them to temporarily shut down. It is a Climate Activist’s dream come true. Unsurprisingly, when you read past the headlines, you find that the real issue is man-made all right: water and land usage by growing populations of residents in the region. Climate models are then employed to predict a megadrought for the region resulting from projecting several degrees of global warming. 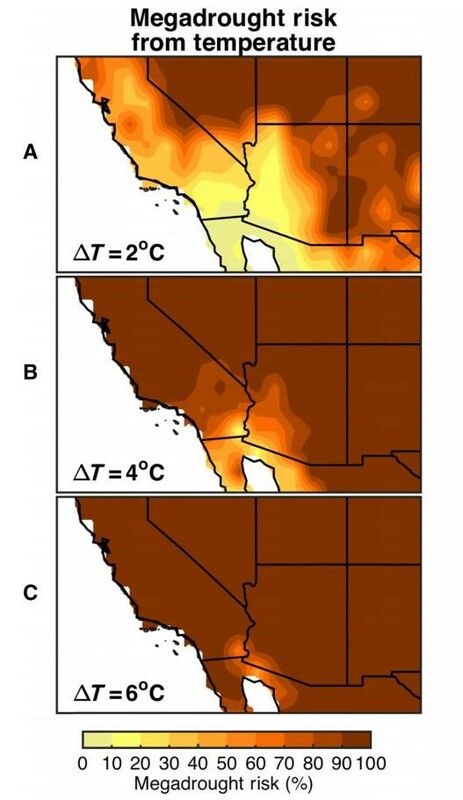 First of all, even though the US Southwest has seen more temperature rise than other US regions, it is still the case that it is not getting hotter, it is getting milder. That is, daily maximums are trending lower, while overnight lows are rising, resulting in milder winters, earlier springs and later autumns. But future temperature increases are not the problem, that is misdirection. 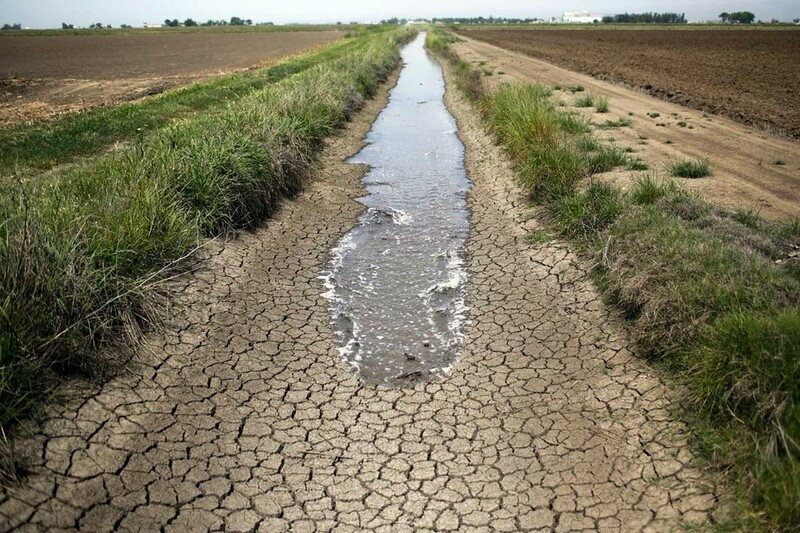 The present water shortages are totally man-made, directly resulting from failed management practices and lack of political will and leadership. It is a cop-out to campaign for CO2 reduction agreements and for a cap-and-trade market (casino to replace the subprime mortgage game). Those initiatives will do nothing for water in the region. Forget “fighting climate change” and get on with adapting social and economic policies to suit the water realities that exist already. OTTAWA — New research suggests that polarizing debates over the impacts of climate change are not the driving force behind local opposition to major energy projects. And that’s something governments and regulators need to consider as they push the transition to clean energy infrastructure such as tidal power, wind farms and hydro electricity. A report to be released Thursday at an industry-sponsored energy conference looks at six controversial case studies across Canada, ranging from the Northern Gateway pipeline proposal in northern British Columbia to a gas-fired electricity plant in Oakville, Ont., and shale gas exploration in rural New Brunswick. The joint project of the University of Ottawa and the Canada West foundation found that local communities are demanding a greater role in major infrastructure, whether it be wind farms, hydroelectric dams or pipelines. Notwithstanding the pitched public battles over climate science and environment policy, the researchers found that in the cases they studied, global warming was not a principal driver of most local opposition. “Climate change bore hardly at all on the local community attitudes in any of the cases,” writes lead author Michael Cleland. Using public opinion research and interviews with project opponents, proponents and local authorities, the report found a “far more important” list of concerns: safety; the need or rationale for the project; economics; local environmental impacts such as water contamination; poor consultation and communication; and local involvement in decision-making. 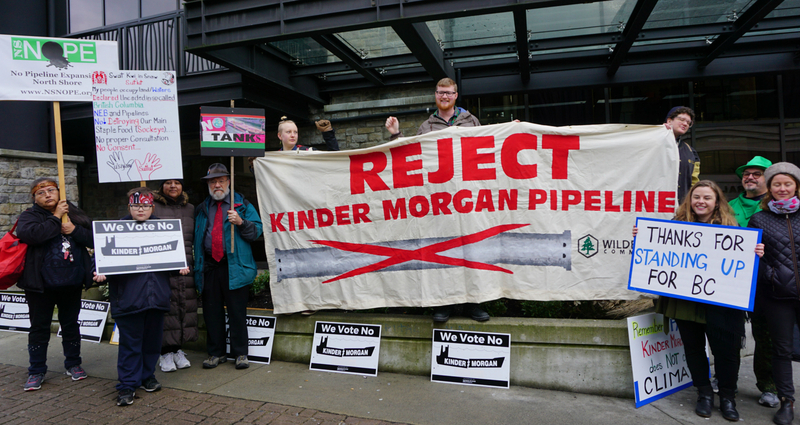 The findings have implications that go far beyond today’s headlines over stalled oil pipeline applications. As the study’s authors write, “the vast majority of future decisions will focus on new ‘clean’ energy infrastructure to underpin a very low GHG economy. Stephane Labrosse, Professor, ENS Lyon The oceanic heat flow shown here is computed from the age of the seafloor using the expression for an infinite half space for ages less than 100 Myr and is set equal to 48 mW m-2 for ages larger than that. Little attention is paid to geothermal heat fluxes warming the ocean from below, mostly because of limited observations and weak understanding about the timing and extent of eruptions. The existence of heat rising through earth’s crust is evident to all, and the large majority of vents are under the ocean. Consider the image above, and notice at the top center is the small black island off the east coast of Greenland, right on top of the orange mid-ocean ridge. Iceland produces more than 50% of its electricity from geothermal, as well as heating numerous buildings from the same source. In addition, farther up under the north pole, scientists discovered an eruption of intense seismic activity beginning in Gakkel Ridge in January of 1999 and continuing for seven months. That happens to be about the time Arctic ice extent took a nosedive, stabilizing after 2007. Researchers have considered the importance of this source of energy into the climate system from various points of view. Some abysmal studies (pun intended) were motivated to look in the ocean depths for the missing heat not appearing in the surface temperature records since 1998. Some warming was found but the case was weak since the Argo records showed no passage of heat between upper and lower ocean strata. Of course no thought was given to the seafloor being the warming source. However, much more serious and extensive research has been done by marine geologists wanting to better understand the cooling of the earth itself. 1. Is geothermal energy powerful enough to make a difference upon the vast ocean heat capacity? 2. If so, Is geothermal energy variable enough to create temperature differentials? 3. Most of the ocean floor is unexplored, so how much can we generalize from the few places we have studied? 1. 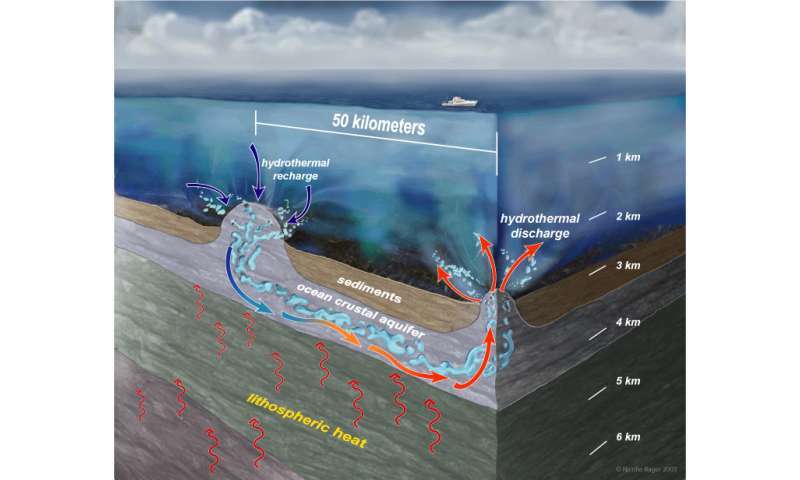 Some researchers conclude that geothermal heating of the oceans can not be ignored as trivial. The total heat loss of the earth is 1002 × 10^10 cal/s (42.0 × 10^12 W), of which 70% is through the deep oceans and marginal basins and 30% through the continents and continental shelves. The creation of lithosphere accounts for just under 90% of the heat lost through the oceans and hence about 60% of the worldwide heat loss. Convective processes, which include plate creation and orogeny on continents, dissipate two thirds of the heat lost by the earth. Conduction through the lithosphere is responsible for 20%, and the rest is lost by the radioactive decay of the continental and oceanic crust. 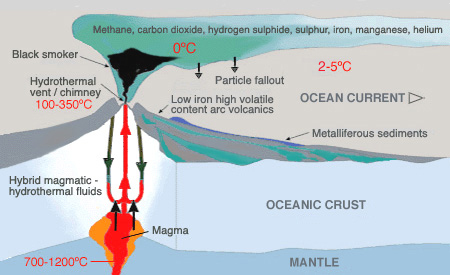 Without geothermal heat fluxes, the temperatures of the abyssal ocean would be up to 0.5 C lower than observed, deep stratification would be reinforced by about 25%, and the strength of the abyssal circulation would decrease by between 25% and 50%, substantially altering the ability of the deep ocean to transport and store not only heat but also carbon and other climatically important tracers (Adcroft et al., 2001, Hofmann and Morales Maqueda, 2009, Mashayek et al., 2013). It has been hypothesised that interactions between the ocean circulation and geothermal heating are responsible for abrupt climatic changes during the last glacial cycle (Adkins et al, 2005). 2. Seafloor eruptions are quite variable and unpredictable, and while localized, can influence ocean circulation patterns. The solar energy flux of 200 W/m2 at the ocean’s surface (Peixoto and Oort, 1992) is much larger than the next largest potential source of energy to drive climate changes, geothermal heating at the ocean’s bottom (50–100 mW/m2 ) (Stein and Stein, 1992), but this smaller heat input might still play an important role in rapid climate changes. It is clear that variations in the solar flux pace the timing of glacial cycles (Hays et al., 1976), but these Milankovitch time scales are too long to explain the decadal transitions found in the ice cores. Another, higher frequency, source of solar variability that would directly drive the observed climate shifts has yet to be demonstrated. Therefore, mechanisms to explain the abrupt shifts all require the climate system to store potential energy that can be catastrophically released during glacial times, but not during interglacials (Stocker and Johnsen, 2003). At the Last Glacial Maximum (LGM), when the deep ocean was filled with salty water from the Southern Ocean, geothermal heating may have been an important source of this potential energy. In modern ocean studies there is an increasing awareness of the effect of geothermal heating on the overturning circulation. As an alternative to solar forcing, Huang (1999) has recently pointed out that geothermal heat, while small in magnitude, can still be important for the modern overturning circulation because it warms the bottom of the ocean, not the top. Density gradients at the surface of the ocean are not able to drive a deep circulation without the additional input of mechanical energy to push isopycnals into the abyss (Wunsch and Ferrari, 2004). Heating from below, on the other hand, increases the buoyancy of the deepest waters and can lead to large scale overturning of the ocean without additional energy inputs. Several modern ocean general circulation models have explored the overturning circulation’s sensitivity to this geothermal input. In the MIT model a uniform heating of 50 mW/m2 at the ocean bottom leads to a 25% increase in AABW overturning strength and heats the Pacific by 0.5 1C (Adcroft et al., 2001; Scott et al., 2001). In the ORCA model, applying a more realistic bottom boundary condition that follows the spatial distribution of heat input from Stein and Stein (1992) gives similar results (Dutay et al., 2004). In both models, most of the geothermal heat radiates to the atmosphere in the Southern Ocean, as this is the area where most of the world’s abyssal isopycnals intersect the surface. The area of the modern ocean is 350×10^6 km2 . The area of the Southern Ocean between 80–85S (the region around Antarctica) is 0.4×10^6 km2 . This factor of 1000 means that the focused geothermal heating of 50 mW/m2 is locally of the same order as the total heat exchange at high southern latitudes. The focusing effect of geothermal heating can cause this heat flux to be a significant fraction of the total heat loss in the crucial deep-water formation zones in the glacial Southern Ocean. This suggests that the geothermal heat is potentially relevant for determining the heat content of the abyssal waters. 3. 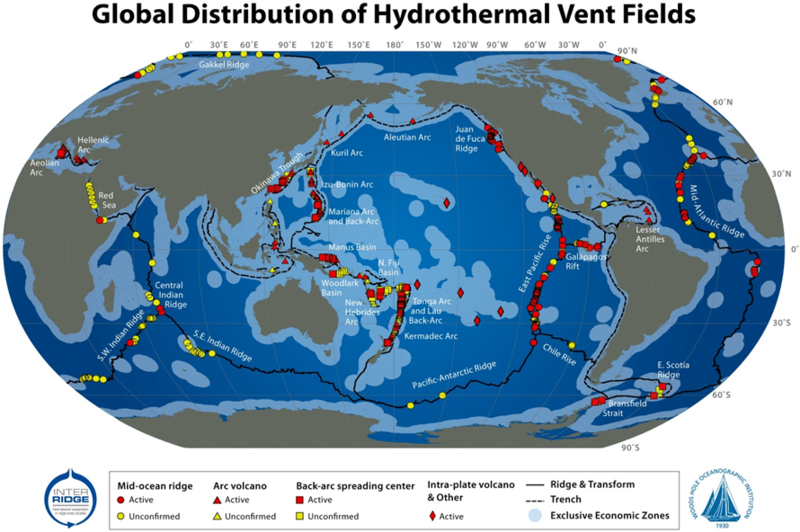 The number of hydrothermally active seamounts is estimated to be somewhere between 100,000 and 10,000,000. Thus, most of the thermally important fluid exchange between the crust and ocean must occur where volcanic rocks are exposed at the seafloor; little fluid exchange on ridge flanks occurs through seafloor sediments overlying volcanic crustal rocks. Seamounts and other basement outcrops focus ridge-flank hydrothermal exchange between the crust and the ocean. We describe the driving forces responsible for hydrothermal flows on ridge flanks, and the impacts that these systems have on crustal heat loss, fluid composition, and subseafloor microbiology. Earth’s geothermal heat output is about 44 TW, with most heat loss occurring through ocean basins (e.g., Sclater et al., 1980; Pollack et al., 1993). Seafloor hydrothermal heat output is on the order of 10 TW, ~ 25% of Earth’s total geothermal heat output, and ~ 30% of the oceanic lithospheric heat output (Figure 1A). Only a small fraction of this advective heat output occurs at high temperatures at mid-ocean ridges; the vast majority occurs at lower temperatures (generally 5–20°C) on ridge flanks, suggesting an associated fluid discharge of ~ 10^16 kg yr-1 (Figure 1B) (C. Stein et al., 1995; Mottl, 2003; Wheat et al., 2003). This low-temperature flow rivals the discharge of all rivers to the ocean (4 x 10^16 kg yr-1), and is about three orders of magnitude greater than the sum of high-temperature hydrothermal discharges at mid-ocean ridges (~ 10^13 kg yr-1). Networks of seamounts permit rapid fluid circulation to bypass thick and relatively continuous sediment across much of the deep seafloor. Fluid recharges into the crust as oceanic bottom seawater, being relatively cold and dense. As the fluid penetrates more deeply into the crust, it warms and reacts with the surrounding basalt, and interacts with the overlying sediments through diffusive exchange across the sediment-basalt interface. Fluid can flow laterally for tens of kilometers through the oceanic crust, with the extent of heating and reaction dependent on the flow rate, crustal age, and other factors. Weaker circulation systems can result in significant local rock alteration and heat extraction, but are unlikely to have a large impact on lithospheric heat loss on a regional scale. The number of hydrothermally active seamounts is estimated to be somewhere between 100,000 and 10,000,000 , based on mapping and seamount population estimates by Wessel (2001) and Hillier and Watts (2007), and the observation that, of the seamounts and outcrops that have been surveyed, a significant fraction appear to be hydrothermally active (Fisher et al., 2003a, 2003b; Hutnak et al., 2008; Villinger et al., 2002). 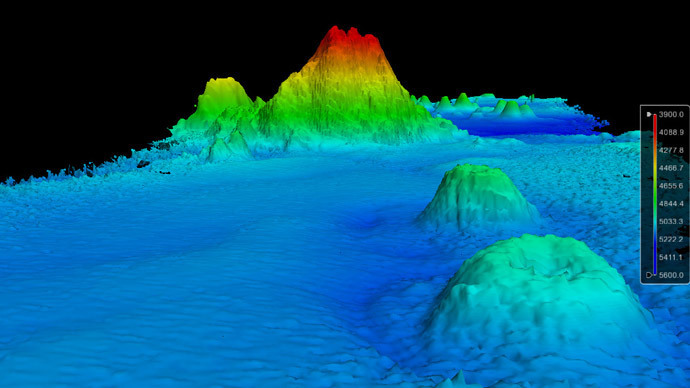 Analyses of satellite gravimetric and ship track data suggest that there could be as many as 1,000,000 seamounts having a radius of ≥ 3.5 km and height ≥ 2 km (Wessel, 2001), and perhaps 10^6 to 10^7 features > 100 m in height (Hillier and Watts, 2007). Given the ubiquity of these features on ridge flanks, it is surprising how little we know about which seamounts are hydrologically active—how many recharge and how many discharge. The thermobaric capacitor has enough energy to overturn the water column, can be triggered by regular oceanic processes, and charges over a time scale that is relevant to the climate record. This source of heat has been dismissed because it is poorly known, and because its eruptive events are unpredictable and can not therefore be represented in climate models. Despite geothermal eruptions having only localized effects, the impact on ocean circulations is significant. But the science is advancing. If heat comes from the seafloor and no one is around to measure it, does it make the ocean warmer? If a man says something and his wife is not around to hear it, is he still wrong?